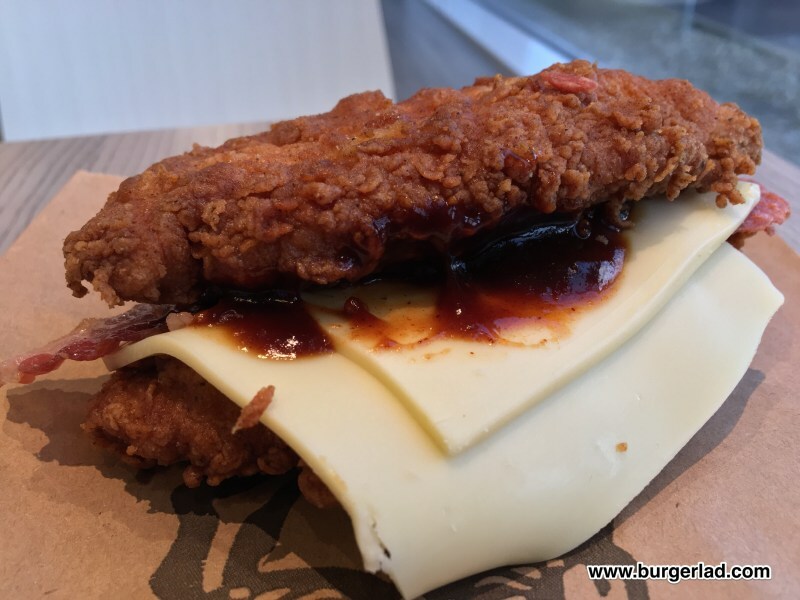 Double Down, 2 Original Recipe chicken fillets, bbq sauce, bacon and Monterey Jack Cheese, it’s finger lickin’ good. Price: £4.99 for the burger only. 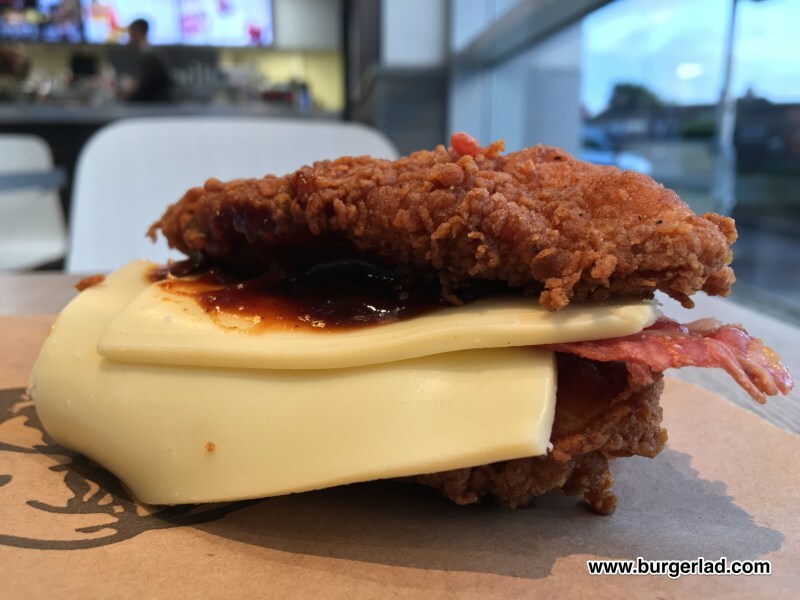 Quite possibly the most infamous fast food sandwich/burger in the world has landed at KFC UK – the Double Down. 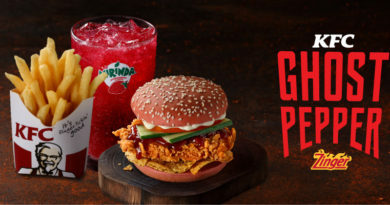 Smart KFC fans like you, will have known about its impending launch after we first started tweeting about it coming on Thursday 28th September. 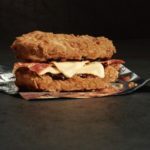 Since the official confirmation, the hype surrounding the release of the Double Down has been intense. Back when I attended the KFC Menu Hack Event, I met with some of the development team from KFC and even then, they said it was more a case of when, not if it would make it to this country. Now, from Monday 9th October, KFC fans can finally get their hands on the Double Down! 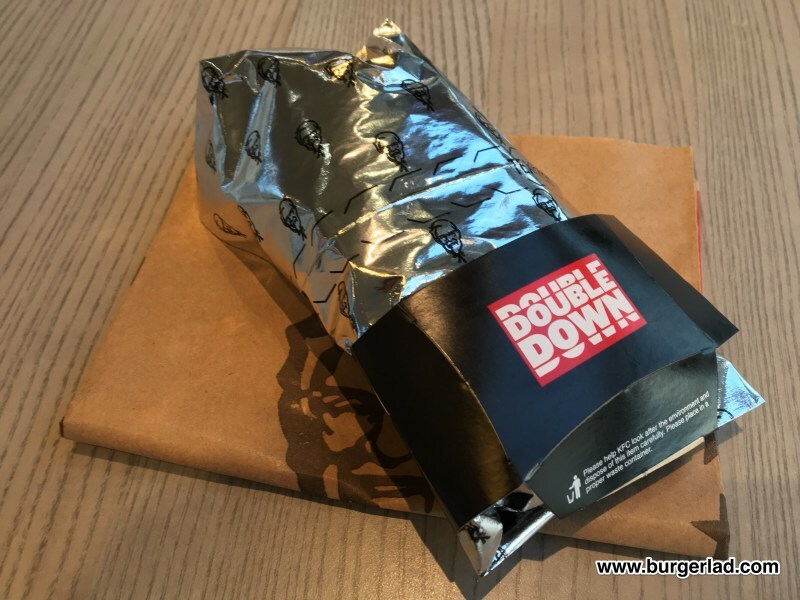 There are two meal versions available – with cheese (£5.79) or with cheese & bacon (£5.99) and I made the mistake of ordering just the Bacon and Cheese Double Down for a pound less. The packaging is suitable for if you are eating it like a wrap so you don’t get your hands (too) greasy. I needed to see the whole thing though and eventually got in without causing too much disruption inside the black and shiny wrapper. 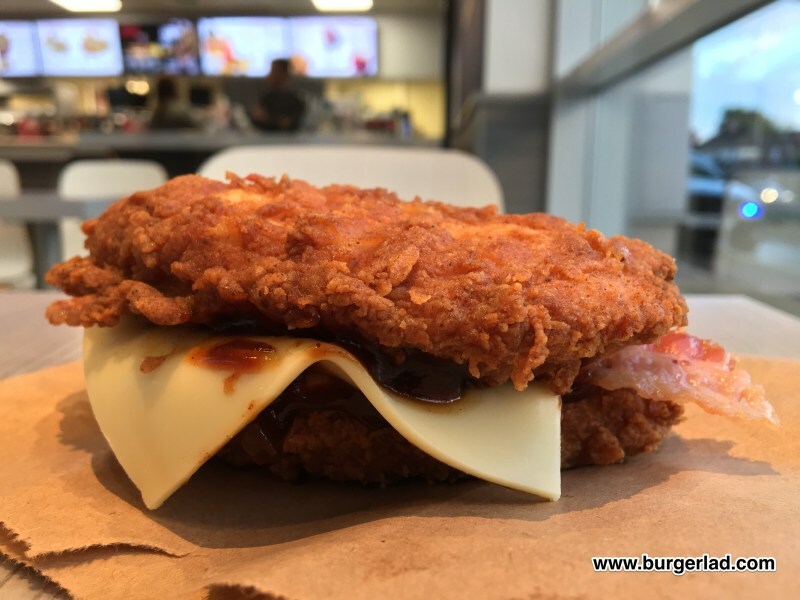 The Double Down looks alright. The cheese is nowhere near melted but that actually helps it in the flavour department. You can definitely taste it and it is slightly creamy. It does look a bit of a mess though with the cheese all over the place. In the end, I had to tuck some back in as didn’t just fancy biting into just a cheese slice. The Original Recipe Chicken Fillets are surprisingly dry to the touch on their exterior so you don’t get too messy. And most fast food fans will agree they are always a decent standard at KFC and the Double Down is no different. The bacon is lost by the double chicken overload – it’s neither thick cut or crispy and you get only the faintest hint of it on your palate if you are lucky. 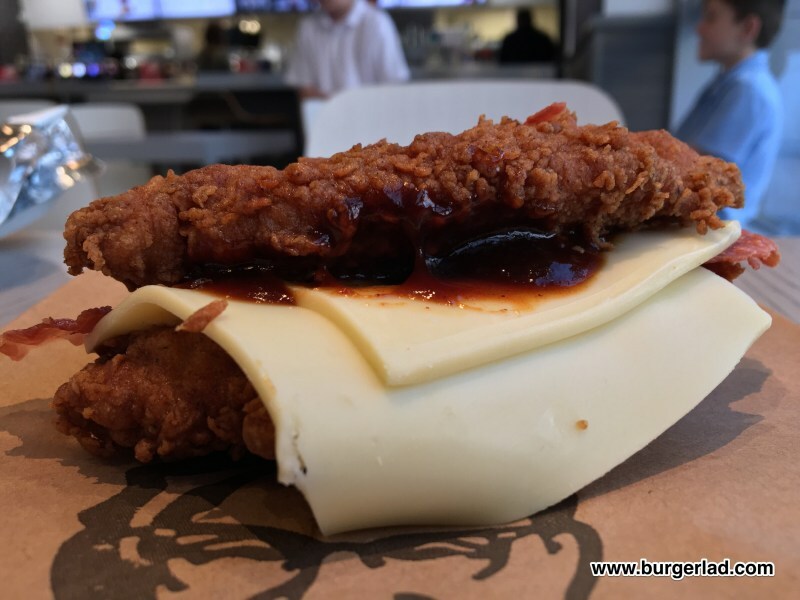 The very first Double Down featured The Colonel’s secret sauce, so when I first saw the promotional pictures I was a little disappointed to find out the U.K. build had good old reliable BBQ instead. That’s a shame… as although I have walked into a KFC adorned with DD advertising everywhere and walked up to the counter (eventually) and ordered a DD, I can’t help thing I’m not getting the genuine thing (echoes of Nashville Hot Chicken in my mind). As you can see in our Double Down list below, there have been many variations around the world. I wish we’d got the original first and then maybe in time, other versions. I guess KFC UK believe that BBQ sauce will sell better and/or is more marketable than the Colonel’s secret sauce? Back in 2013, when we hacked the menu to create our own version, I wrote that I doubted we would ever see the DD in the U.K. and today I was proved wrong. You might walk away from this experience wondering just what the excitement was all about though. And I wouldn’t blame you. 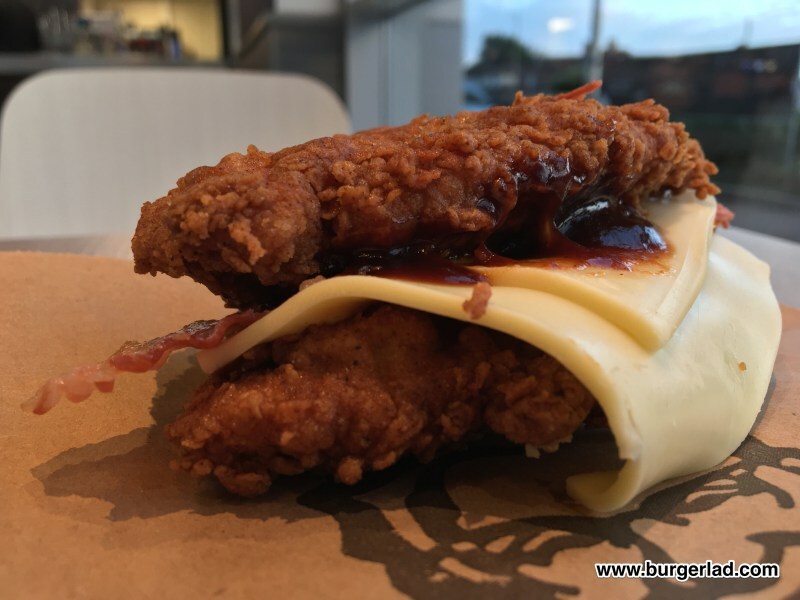 It’s good for us to finally get the opportunity to try the Double Down, albeit not quite in its original format. I certainly enjoyed mine and I’m glad to see it in the U.K. but it’s perhaps not as amazing as I anticipated or had built up in my mind. Looking past all the media hype (inc. coming from this website!) I can honestly say it’s not (IMO) in the same league as the Dirty Louisiana. 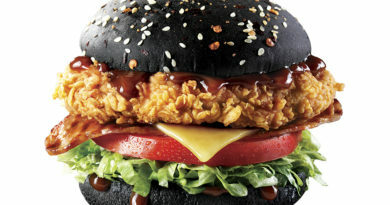 Whatever you think about the Double Down, KFC have really created a social media buzz (possibly more fervent than the McRib) around it. Just don’t go into KFC expecting a life changing experience. 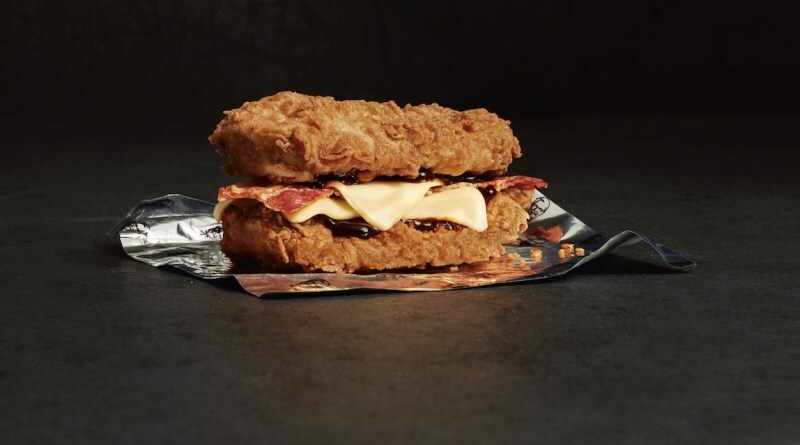 The Double Down is at participating KFC restaurants until Sunday 19th November subject to availability. It's the freaking Double Down!